Much has been said and written about global warming. When doubt was cast on the accuracy and validity of the global warming theory, it was renamed “climate change.” I must admit that anybody who believes there is no such thing as “climate change” is a fool. Clearly climate, or weather, is not the same year to year or age to age. But does that necessarily support the hypothesis that man-made activity is bad for the climate? I decided to examine the question a little more deeply. What I found was a lot of smoke and mirrors, so discerning the truth is a bit difficult. Multitudes of graphs and articles are available espousing the view that the end of the world is near because we are destroying the atmosphere. A similar number of graphs and articles espouse the position that we are actually experiencing global cooling and have nothing to worry about. Unfortunately very few of these graphs and articles have any substance and backup data to determine their truth. So how can we approach the problem? Is it possible to make sense of it all? I believe it is, if we look at the big picture. A number of years ago I had a car. It had a mechanical speedometer, and the speedometer cable was slightly kinked. Therefore the speedometer needle oscillated back and forth about 10 mph at 60 mph. The oscillation was about 1 per second; thus I could never get an exact instantaneous speed reading, but had to mentally average and guess the true speed – but that presented no problem because I only needed to know the average speed of the car over a second or two anyway. That oscillation is the “noise” of the system, and the mental average is the “signal.” As long as the noise is small compared to the signal, it is relatively easy to differentiate between the two. The car also had an undamped gas gauge. So whenever I accelerated with a half full tank, the gauge would swing to “Empty”, and whenever I stopped it swung to “Full.” In between it bounced around as the gas sloshed in the tank due to the car’s motions. Thus it was extremely difficult to estimate the actual gasoline level of the tank because the noise (the sloshing) masked the signal (the true gas level). In fact, if I didn’t know otherwise, due to the noise of the system I could rationally conclude that whenever I braked the tank would somehow get filled up, and whenever I accelerated the car guzzled gas incredibly fast! Of course I knew better because I understood what was happening. To some extent we are experiencing similar phenomena with climate change. The thermometer bounces around like the gas gauge due to a myriad of factors beyond our knowledge and our job is to differentiate the true signal from the noise. So, let’s begin. Going back to the car’s gas gauge analogy, we must first understand the temperature’s true behavior and approximate state (e.g. true gas tank level) to discern the noise from the signal. Let’s examine the data we have, starting with long-term data. Human civilization existed only during the last “hot” period, so none of these temperature changes were human caused – they were all naturally occurring phenomena. Finding a good image of claimed global warming is not as easy as one would expect, but this is one that looks at temperatures during the last 30 years. In 1979 the temperature was about -0.2oC. In 2008 it was about -0.18oC, resulting in a net change of only +0.02oC over a thirty year period! (See dashed green line.) Yes, it “wobbled” quite a bit during that period (1.25oC overall), but that is mostly “noise.” I have also added a visually averaged line (blue), which removes some of the noise due to monthly fluctuations. Nevertheless a significant amount of fluctuation, or noise, remains. No matter how one looks at this chart, it is difficult to quantify any significant warming effect. But even if one wanted to “create” a warming trend, the best one could do is about +0.2oC to +0.3oC over the period. Such warming represents just 10% of the typical temperature variations (noise) the earth experiences during its “hot” periods. Thus there is no effective change in temperature during the past 30 years. It’s all noise! Now imagine the chart had ended about month 230 (see 1998 peak). Our conclusions could have been quite a bit different, and we could have possibly justified the existence of some kind of warming phenomenon due to the -0.2oC to +0.65oC (+0.85oC total) net change in 20 years. 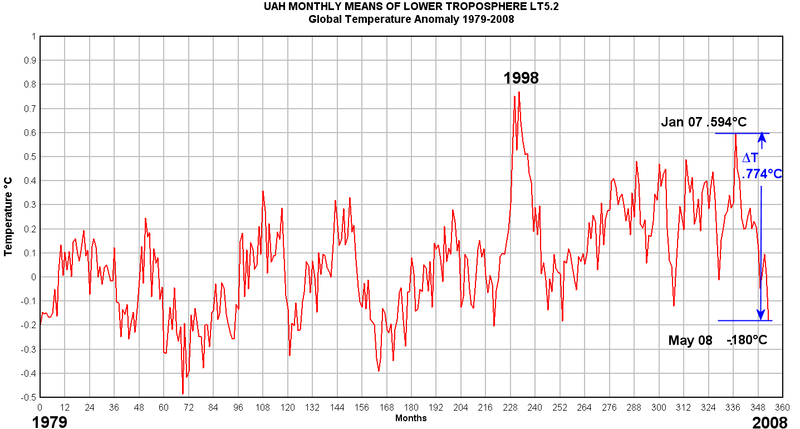 In fact, Michael Mann’s famous “hockey stick” prediction of catastrophic global warming was based in part on an extrapolation of the sudden 1998 thermal spike. But subsequent historical data shows that spike to be simply part of the overall system noise. Therefore this is an excellent example of how projections made on the basis of system noise inevitably produce unreliable results; yet most climate change projections are made exactly on that basis. Here is a look at temperature estimates over the past 800 years or so. The overall temperature change during that interval is also only on the order +0.2 to +0.3oC. That change, too, is insignificant and in the noise. There are other factors one may consider, including temperature measurement accuracy and the effect of CO2 on climate, but they do not change the conclusion. The problem, it turns out, is not global warming, but possible global cooling due to natural and man-made causes. Therefore by creating global warming we could actually be delaying the onset of the next natural disaster, which is global cooling. The people wanting to “save” the world could actually be accelerating its pending devastation! Global warming a problem? No way. CO2 emissions the cause of global warming catastrophe? Not in your life. Man made climate change a possible problem? Absolutely – beware nuclear winter! The amazing hubris of man is incredible! Though we are insignificant, in our pride we feel we can impact and control global climate. And just as the two year old may cause the 747 to crash if he accidentally turns off the autopilot, we too can create global natural disasters because we don’t know what we don’t know and ignore God’s guidance.